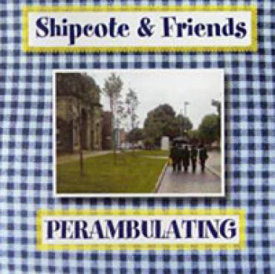 Take a man who loves country music, especially the Swing variety, a hometown that he loves without waver, and a roomful of musicians who love making music, and you get Shipcote & Friends‘ latest offering, Perambulating. Graham Anderson, a.k.a. Shipcote, has been involved in the music scene for a lot more years than you’d expect from seeing his youthful good looks. In the finest traditions of his craft, he writes about what he knows, which is the people that surround him. This delightful album opens with an homage to teenage children, titled “Homewrecking”. Every parent will smile at the lyrics, as Shipcote talks about tantrums and love above a rolling accordion and gently rocking guitar backing. “Frail Old Lady” is a gorgeous observational song that never becomes mawkish, but will still make many an eye mist over with the life story of a loved one. There are two songs that follow each other that require a bit of background, as they are both written about the town of Gateshead, which stands in the shadows of its neighbor Newcastle. It’s a bit like New Jersey to New York, if you don’t mind a bit of exaggeration. The original “Angel of the North” is a huge artwork that stands next to the motorway and has become a symbol that welcomes visitors to the region. It’s used here as a metaphor for two lonely people “accidentally meeting” at the same time every day in the local park — she walking her dog, he walking to and from his wife’s grave. The use of language to describe their feelings is worthy of the young Morrissey, and Shipcote and Kathy Weslowski’s voices catch the mood and tone perfectly as the drama unfolds. This is followed by the title track, “Perambulating (in Gateshead)”, which name checks everything from the delights of Superpie to the Jewish Community. It adds up to become a damn fine love song which has the measure of “New York, New York” or “Streets of London”, in its own little way. As always, I have a favourite track: the charming Country duet with Hannah Rickard “Instead of Spending Your Day on Facebook (Spend Some Time with Me)” is nowhere near as twee as the title would suggest. It’s a story about a love affair that is disintegrating and social media isn’t helping. Observational? Not half! Every song is played out to a lovely sheesh-sheesh beat on the snare drum. There’s honky-tonk piano, fiddle, and banjo that could come from Alabama instead of the backstreets of a Northern industrial town. When the pedal-steel comes into play, it will send shivers up your back and down the other side. Music doesn’t have to be complicated to be great; as this album proves.